Austrian-Hungarian 24,500-ton battleship of the 'improved type TEGETTHOFF', which was not built in 1914 due to the outbreak of the war. 86 cm long model in the scale 1: 200 by Dipl.-Ing. Otto Schetina, Zeltweg. Digital photo for the book by L. Baumgartner / E.Sieche: The ships of the k.u.k. Kriegsmarine im Bild, Volume 2: 1896-1918; Publisher Stöhr, Vienna 2001. CAP RIBBONS: The military chancellery of the heir of the throne prepared in 1911 a list of possible names for future ships. As at least one ship would have to be constructed at the Hungarian yard “Ganz & Co. – Danubius” at least one or may be two ships would have a Hungarian name. The cap ribbons are of course pure fiction, the names taken from the 1911-list. Maybe that in 1914 other names would have been proposed. The last decision made the Emperor himself. Some 15 years ago a German model builder, Mr. Lohberger (†), produced for Erwin Sieche a demonstration model of the forward turret section in the scale 1:100 and turrets in 1:50. Austro-Hungarian battleship class ordered in July 1914, but never laid down. Four were to be built at a cost of 82 million crowns, to a design drawn up by the deputy naval constructor of the KuK Marine, Franz Pitzinger. It resembled the previous Viribus Unitis class, but the displacement of 24 500 tons (22-1/2 % more) gave a margin which allowed for better protection as well as heavier armament. The underwater protection was a radical departure from previous Austro-Hungarian practice, and resembled the French system first introduced in the Henri IV and used in later French and Russian designs. A horizontal armor deck was carried inwards from the bottom edge of the belt, as far as the last of the three vertical bulkheads. A new 350mm (13.8-in)/45-cal gun was adopted to increase the weight of the broadside, but to maintain a balance between protection, stability and firepower, only ten guns were provided. The arrangement was unusual, with two triple turrets superimposed over two twins, enabling the metacentric height to be kept high, to avoid excessive heeling if damaged. The Ersatz Monarch was to have been the Schiff VIII and the Ersatz Wien the Schiff IX, while Ersatz Budapest and Ersatz Habsburg would have become Schiff X and Schiff XI. The ships would have been ordered from Stabilimento Tecnico, Trieste, Italy, and the navy yard at Pola, but contracts were never allocated. The KuK Marine followed the German custom of withholding the names of new ships until the launching day, and referred to them merely as replacements for old ships, hence Ersatz (replacement). Several sketch designs were produced, and the final appearance of the ships cannot be known with certainty, but they all had raised forecastles for better seaworthiness. Another noteworthy feature was the provision of lattice towers amidships to carry searchlight platforms, and the 150mm (5.9-in) guns were carried higher than before. The 350-mm (13.8-in) L/45 was designed by Skoda, and had a muzzle velocity of 820 m/sec (2690 ft/sec). It weighed 74 tonnes and fired a 635-kg (1400 lb) shell about 31 500 m (34 450 yards). The guns for Schiff VIII had been ordered from Skoda's factory at Polsen before the outbreak of the war, but no further orders were placed. Four guns were delivered to the army in 1916-18 for use on the Italian front and the remainder were seized by the French as war loot. By the end of 1917 all four vessels had been cancelled. Funds for the construction of the four dreadnoughts of the Tegetthoff-class had hardly been approved when the Skodawerke A.G. made a first effort to get the planning for the next generation of super dreadnoughts started. They submitted plans of 13.5in (34.5 cm) cal 45 guns in triple and superimposed twin turrets on April 18, 1911. The Naval Technical Committee submitted its first ideas about 22,000t, 23,400t, and 24,500t battleships in December 1911. As a consequence navy intern discussions started on the guns caliber, which ended with the decision to give preference to the 13.78in (35 cm) guns. Reason was that a standard shell could have been developed with the Imperial German Navy, which had selected this caliber for its new battle-cruisers of the Mackensen class. Moving in this direction, the Naval Technical Committee delivered the first detailed construction studies for a 24,500t battleship with ten 35cm cal 45, eighteen 15cm cal 50, and twenty two 9cm cal 45 guns in January 1913. 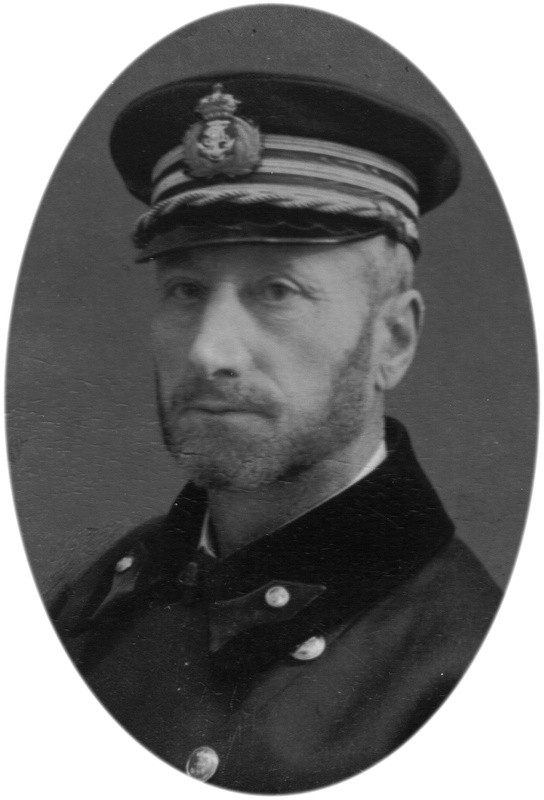 Giving in to pressure from the heir to the throne, the CinC, Marinekommandant Admiral Rudolf Count Montecuccoli retired at age 76 on February 16, 1913. His successor became the 62 year old Vice Admiral Anton Haus. He succeeded in getting another special navy credit approved on May 28, 1914. An amount of 426.8 million kronen (2004 EUR$ 1.8 billion US$ 1.6 billion) was allocated within the 1914-1918 budgets. It was intended to build four dreadnoughts (Ersatz Monarch class respectively improved Tegetthoff class); three Scout cruisers (Ersatz Zenta); and six destroyers (Tatra, 2nd batch). The planning phase for the improved Tegetthoff type (generally called Ersatz Monarch) came to an end by deciding for the 24,500t variant of July 1914, armed with ten 35 cm cal 45, and fourteen 15 cm cal 50 guns due to lack of space in double level casemates. With great certainty, it can be assumed that these battleships would have been built according to this design. Ship names, like Laudon or Hunyadi, are nothing but speculation. Following the assassination of Archduke Franz Ferdinand and his spouse, the Duchess of Hohenberg, in Sarajevo on June 28, 1914, and Austria ultimatum to Serbia, the mechanism of European alliances prevented a localization of the Austro-Serbian conflict. A chain reaction of declarations of war ended in a world war. According to the Austrian mobilization plans, all floatable ships under construction were to be brought to Pola for completion of construction. No new construction was to be started. Since the majority of ship yard workers were drafted into the army, the Navy stated its willingness in a meeting of the Austro-Hungarian Minister Council on common agendas on February 3, 1915 not to make use of the special credit, but to freeze it till the end of war. A new, revised fleet program would then be submitted. Comparison between Poppers design of the 21,500-t-Tegetthoff type and Pitzingers design of the 24,500-t-improved Tegetthoff type (also dubbed Ersatz Monarch class) shows that Pitzinger, who faced heavy internal criticism, had to squeeze a maximum of offensive power into the smallest possible displacement. Like his predecessor he had to accept dimension limits and save weight wherever possible. He retained the projecting Szent István type searchlight platforms. But the armour belt did not follow the contemporary rule “armour belt thickness = main gun calibre”. The “armoured mine-bottom” (25+25 mm) introduced by Popper was omitted, the inner double bottom was reduced to only 10 mm, the thickness of the outer hull was increased from 16 to 20 mm. As a small consequence of the German underwater-explosion tests of 1906 –and most probably the Austrian ones of 1914– he placed the 18+18 mm longitudinal torpedo-bulkhead 2.5 m more behind the “wing-passage”. These tests showed that a maximum room depth of at least 4 m was necessary to buffer the expanding detonation gases. After 1918 Popper had to sustain much criticism because two of the battleships he had designed, had sunk after a short time because the “wing-passage” measured only 1 m and therefore was too narrow. Left: Battleship paint colour Hausian, used above the waterline. Left: Battleship paint colour used at the waterline. Left: Battleship paint colour used under the waterline (anti-fouling green). Shows the cruising radius, coal consumption and some other parameters for the speed range from 1 to 23 knots in comparison to US BB-29 NORTH DAKOTA. Is from the January 1913/July 1913 variant and shows the arcs of fire, including these 4 guns. "The man who designed the ship"
Franz Pitzinger was born in Enzersdorf, Lower Austria on May 22nd 1858. He studied machinery engineering at the then Technical Highschool (today Technical University) Vienna and started his professional career as a design engineer with »Clayton & Shuttleworth. He joined the Austrian Navy as provisional shipbuilding apprentice in March 1st of 1886. On April 12th of 1888 his appointment became definitive and on March 1st the same year he was promoted to the rank of a shipbuilding-engineer 3rd class. In 1898 he was transferred to the A-H naval academy at Fiume (today Rijeka) teaching ship- and machinery construction. He returned to the naval arsenal at Pola in 1901 and was responsible for battleship construction. Shortly later he was promoted to Vice-director of the Naval Arsenal. 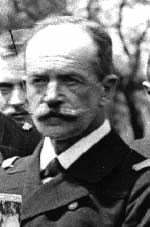 In 1907 he was appointed to supervising director of naval construction for the Radetzky-class battleships under construction at the Stabilimento Technico Triestino. In 1908 he became director of naval construction at the naval arsenal Pola. Promoted to head the Naval Technical Committee's 1. Division (naval construction) at Pola on June 11th 1910 followed by his appointment to Supreme Naval Constructor (design engineer) on November 1st of the same year. On November 1st 1914 he was promoted Naval Constructor General. He designed the 24,500-t-battleships of the improved Tegetthoff class which had been authorized by Parliament on May 28 of 1914 as part of the 1914/15 naval budget. Because of the outbreak of World War One the keels of these four super-Dreadnoughts were never laid down. 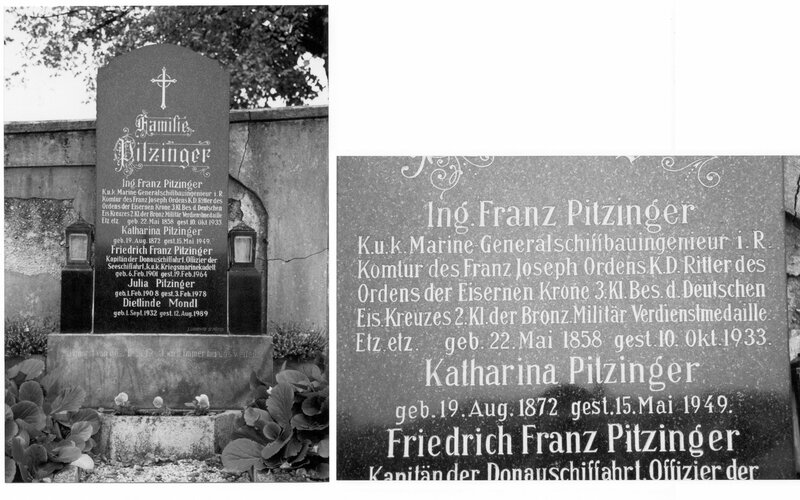 Pitzinger died at Hofstetten where he had lived after retirement on October 10th, 1933 and is buried at the nearby local cemetery of Hofstetten. On 2 March 1911 the mutual financial delegations of Austria-Hungary approved a big naval budget allowing the construction of the four dreadnoughts of the TEGETTHOFF-class, 3 scout cruisers and 6 modern turbine destroyers. Very soon after this approval first ideas for the next class of battleships came up. Since long the Austrian Naval League (Oesterreichischer Flottenverein) had advertised in his monthly magazine Die Flagge: “The MONARCH-class must be replaced”. Therefore this next class of battleships often is called the 'Ersatz MONARCH-class'. In the official files, anyway, this design was first given project numbers (project I, II, III and so on) or tonnage designations (22.000 ton battleship, 23.400 ton battleship and the final variant 24.500 t battleship), finally they were referred to as the »improved TEGETTHOFF-class, which might be the historical correct label. It is remarkably that the desire of building a new group of dreadnoughts first came from the Skoda Werke AG and not from the Austro-Hungarian Navy. While completing the 30,5 cm triple turrets of the TEGETTHOFF-class Skoda was asking for follow up business arguing with the necessity of securing high skilled jobs and ensuring development continuity. So 18 April 1911 Skoda submitted to the Naval Section detailed plans for 34,5 cm twin and triple turrets. They had thought in advance for the Austro-Hungarian naval architects and proposed triple turrets and superimposed twins in the centreline. This design had a remarkably resemblance to contemporary British turrets. The displacement limit was caused by the need to fit the future ship (with half consumption supplies and full ammunition load) into the floating drydock No 1, which had a lifting power of 23.800 metric tons. It was believed, nevertheless, that such a design could match contemporary opponents by cutting down the cruising radius, e.g. saving fuel weight, regarding the geo-strategic situation of the Adriatic Sea. The most remarkable fact was the desire for an alternative design for both Diesel and turbine propulsion. But soon Diesel was rejected against conventional mixed coal/oil burning boilers. December 1911 the Austro-Hungarian Naval Technical Committee (MTK = Marinetechnisches Komitee) presented its design for both variants A and B (see table). The demand for more secondary armament – 15 cm – was solved by using twin casemates. The surmounting of the strict tonnage limit which turned out after exact displacement calculations led to a series of sub-variants with reduced poop-deck and other measures to save weight dating from February to May 1912 (see table). Also in December 1911 the private owned yard industry tried to demonstrate once again their predominance in design questions and the firms Ganz éz társa -Danubius, Stabilimento Tecnico Triestino, Cantiere Navale Triestino and the naval architect Silvius Morin presented no less than 26 alternative designs. But Poppers successor, Oberster Schiffbauingenieur (supreme naval architect) Franz Pitzinger did not want to be overruled a second time like in the TEGETTHOFF-class and all other designs were rejected. In the mean time Skoda was asked to work out new designs for the 34,5 cm turrets. A board held 12 May 1912 increased the final calibre to 35 cm to match the loss of penetration power given by the new standard shell to be developed. A second reason might have been the compatibility with German ammunition: compare the German battlecruisers of the MACKENSEN class. January 1913 the Naval Technical Committee presented its next design (see table). Caused by the strict weight limit the designers had to save every ton possible and therefore reduced the secondary artillery, omitted the aft conning tower and the mainmast and designed the heavy guns in triple turrets superimposed over the twins to better follow the curve of the hull. As this obviously inflicted stability the ammunition load was reduced and in July exactly the same ship was presented with superimposed twins. 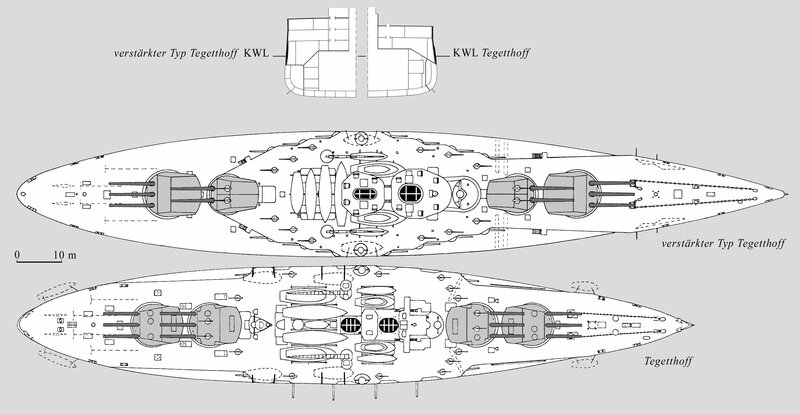 Apparently the Austro-Hungarian naval architects felt that such a stripped down design would not be well balanced and presented two enlarged alternative designs in January 1914, showing that more displacement was necessary to make up a well balanced dreadnought with the benefit of a speed increasement of two knots. This is only a first draft, but it shows the estimated building times and the intended distribution between the Hungarian and the Austrian yards. From the political point of view the history of the improved TEGETTHOFFs was not a repeat of the story of the TEGETTHOFFs although the industry wanted for a second time to start construction on credit. In March 1913 the Heir of the throne, Archduke Franz Ferdinand, urged the new head of the Austro-Hungarian navy, admiral Anton Haus, to order the new dreadnoughts because the last of the STT built TEGETTHOFFs, the PRINZ EUGEN, had been launched since four months and the yard needed urgently a follow up contract. But the Hungarian authorities headed by primeminister Wekerle refused to start building on credit, arguing that the only legal way would be providing funds in the 1914/15 budget. Even the Emperor himself tried without result to convince the Hungarian minister of finance, Dr. Teleszky, to start construction before the budget was approved. But Weckerle refused. And not before 28 May 1914 the 1914/15 budget was approved by the mutual delegations. This included a special credit of 426,8 million Crowns, enough to built the new battleships VIII - XI. End of June STT was ordered to build No VIII and Ganz éz társa – Danubius to build No IX. As we all know just in the same time the fatal murder of Sarajevo set an abrupt end to all ship construction because of the outbreak of World War I. On 3 February 1915 the Austro-Hungarian navy administration definitely declared in a meeting of the ministers for mutual affairs (Ministerrat für gemeinsame Angelegenheiten) to ‘freeze’ this money and present a new fleet program to the mutual delegations after the end of the war. The Waffenfabrik der Skodawerke A.G. received the contract for the first batch of guns for the 'improved TEGETTHOFFs' 24 July 1914: 10 guns plus one spare barrel for the first unit. 22 November 1914 a 35 cm trials barrel was tested at the Skoda gunnery proving ground at Bolewetz. On 28 May 1915 Skoda reported that gun No 1 plus cradle is ready for delivery. On 9 March 1916 gun No 2 was tested at the Skoda gunnery ground at Bolewetz. In April 1916 gun No 1 was tested at the Hungarian gunnery proving ground at Hajmaskér and achieved a range of 35 kms. The same month the gun is going to the Italian front to form a mixed battery together with a 38 cm cal 15 howitzer. It has often been published that this gun was named Georg, but there is no proof in the official files, maybe it was an inofficial name given by the field troops. 10 April 1916 the Heir of the throne, Archduke Karl, the later Emperor Karl I., inspected the battery. 16 to 22nd of May 1916 gun No 1 fired against targets near Asiago, Fondi, Gallio and Camporovere. A total of 122 shots was fired at ranges of 25 kms until the aiming error became so significant that the gun had to be returned to Skoda for refurbishing. 30 May 1916 gun No 1 returned to Skoda to be changed against gun No 2, but this never happened because No 2 had been sent to the Bulgarian front. It’s goal was to destroy Romanian fortifications on the Danube when Marshal Mackensen's Army crossed that river attempting to encircle the retreating and defeated Romanian army near Bucharest. So on 23 and 24 November 1916 gun No 2 was in action near Svistov, but only a few rounds were fired. 18 May 1917 gun No 3 was tested at the Skoda proving ground Bolewetz. Gun No 1 returned from the front. Gun No 2 delivered as B.K. L 45/No 2. (B.L. means Belagerungskanone, e.g. siege gun). Gun No 3 is completed at Skoda. Gun No 4 is in the final stage of completion. Guns No 5-11 are in different stages of completion. Above: One of the manufactured 35 cm barrels. The particular spur-gear typical for a turret mounted naval gun is clearly visible. Most probably this photograph has been taken at an artillery proving ground. Above: The collection of the future Museo della Guerra per la Pace at Padriciano near Trieste, Italy, holds two cartridges of Austro-Hangarian naval guns. The greater one has the dimensions 1440 mm, diameter 360 mm, inscription on the base reads 'Berndorf 1916 / 342'. Berndorf is the manufacturer. Most probably it comes from gun No 2 which was posted at Santa Croce near Opicina/Opcina in fall of 1917. The second cartridge has the dimensions 1280 mm, diameter 310 mm, inscription on the base reads 'Berndorf 1906 / I 58'. Most probably it comes from a battleship of the RADETZKY-class. The author is in the picture for size comparison. Gun No 2 was later sent to the Italian front and installed end of August 1917 at Santa Croce near Opcina/Opicina above the city of Trieste. 23 September 1917 it was ready to fire against the long range Italian coastal batteries situated between Grado and the Isonzo estuary. 18 October gun No 2 fired the first shot over the gulf of Trieste against Grado. The final fate of these guns is not really clear. It is said that gun No 2 returned from the Italian front to Skoda while No 3 was sent from Plzen via the Vienna Artillery Arsenal to the front. According to one source it reached the front and was in action up to the Austrian collapse end of October 1918 when it was captured by the Italians. According to another source it was left in Yugoslavia just behind the new Italo-Yugoslav frontier. According to a third source the gun left in Yugoslavia was not No 3 but No 4 which had been delivered to the Vienna Artillery Arsenal just before end of World War I. At any rate, the Yugoslavs possessed one 35 cm cal Skoda gun in the interwar period. Another 35 cm gun fell into French hands, and it was most likely gun No 4 which they had sized in Austria. The table shows that 15 different designs studies were submitted by the Naval Technical Committee during the three year design process. As all these were presented with a full set of plans, researchers and naval historians asking for those plans at the Oesterreichisches Staatsarchiv/Kriegsarchiv, Vienna, Austria, were often supplied with one of the different versions by pure chance. Since the twenties we find different drawings in the reference books, each one claiming to be the 'real' one. This lead to great confusion about the final appearance of the 'improved TEGETTHOFFs'. Especially the question of superimposed twin or superimposed triple turrets was never really clear for a long time. But the date of issue clearly shows that the design of July 1914 with superimposed twins would have been the final choice. A new 9 cm gun was envisaged for the improved Tegetthoffs. (Hypothesis: as the foregoing 7 cm gun in fact had the calibre of 66 mm maybe that the 9 cm gun would have a calibre of 88 mm.) This gun did not exist, when the ship’s keel laying was scheduled. According to the war it was postponed and developed late in the war. These are scans of the original Skoda plans. In A-H nomenclature TAG means ‘Torpedoboot Abwehr Geschuetz”, e. g. Anti torpedoboot gun. In consequence BAG means “Ballon Abwehr Geschuetz”, a somehow antiquated name, it was simply a AA gun. L/45 means the length of the barrel, in English described as cal 45. Curriculum Vitae: Floating experimental objects for artillery experiments and seaman experiments to test the armor and the torpedo protection. Completely made of iron or steel according to the floor and the side wall of the projected ship. The earliest known objects of this type were used for artillery experiments of Armstrong muzzle-loaders from sections FERDINAND MAX and HABSBURG. Later, other objects for the casemate ship CUSTOZZA and following were made, the last, most famous, for the battleships type ERSATZ MONARCH 1914. With the elevation of 1875 submerged object was due to the excessive weight greater problems, so that it only after the expansion of 290 tonnes of ballast in February 1877 could be lifted. The work then led to the emergence and systemization of the divers training courses. Shipbuilding plans z.T. in the war archive Vienna available. To optimize the underwater protection scheme of the abortive super-dreadnoughts of the ‘improved TEGETTHOFF-type’, dubbed ‘Ersatz MONARCH-class’ of 1914/15 a special TEST BED was built and underwent blast tests in March 1914. The complete technical documentation of these tests –filed as II GG 4 K-1 in 1914– was probably sacked immediately after the war by one of the Allied fact-finding missions as ‘prize of outstanding technical importance’ and are missing today in the files of the Austrian State Archive/War Archive. Only a handful of photographs survived, as shown here. More news and pictures in: K. u. k. Fleet, p. 46. Baumgartner / Sieche: Kriegsmarine in picture 2, p. 250. Navy Yesterday Today 1980, p. 110.